If you’re a regular blogger like I am, sometimes it can be a challenge to develop a sustainable practice for adding fresh content to your blog. I’ve been working on streamlining my blogging process, even though I’ve been blogging regularly for years. While it’s always a work in progress, I thought it might be helpful to share the framework and encourage you to get writing! I use a project board on Asana with “cards” that hold notes and links to the Google Drive docs where I’m writing posts. The documents live in one of the following categories as they make their way to publication over time. This column stores the ideas for blog posts that come to mind randomly. Writers are never really “off the clock.” Creatives are generally in a regular mode of observing life, and a blogger will often think, “I feel a blog post coming on” when experiencing or observing a situation. This happened to me while vacationing in Tybee Island, which ultimately led to the blog post, What Body Boarding Teaches Us About Career and Business. A special email address is attached to this board, so I can email my ideas right to it. Here I store the cards that represent posts that I have initially written. Once a week, I do a series of “sprints” using a timer. I pull a card out of the “perculating” column, writing all I can about the topic until the timer goes off, then move it into the “produced” column. I move a card into this column when an additional layer of editing has been done. This editing is more like polishing the post–it’s not about adding more content to it. I move cards into this column when I’ve done a full proofreading on it, or have had one of our team members do so. Cards here represent posts that are fully scheduled (with photo included and any other behind the scenes work like SEO and categorizing done) in the blog’s timeline. 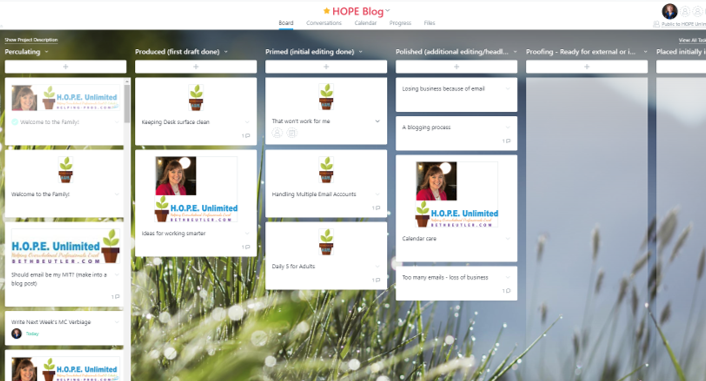 With this system, a blog post can take weeks–even months–to move from idea to final publish. I usually have posts scheduled a minimum of two weeks in advance, and ideally, a month or more. I feel this process allows ideas to simmer and marinade for a period of time, plus it often provides helpful space from the point of an illustration to when a blog post appears. (See my post about How to Avoid Hurting Someone with Your Blog.) It gives time for adequate editing, polishing, and proofing, making the post one of higher quality. It’s going to be on my website for a long time to come, and this process helps me practice the craft—the art—of writing. This is a discipline I need since I often think on my feet and write quickly. Fast food can work sometimes, but a slow home-cooked meal is often more satisfying.